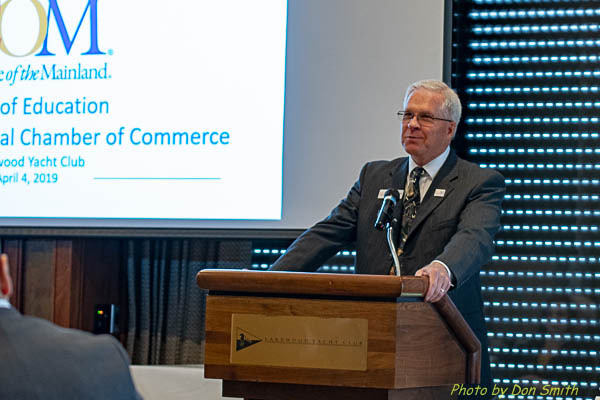 College of the Mainland President Dr. Warren Nichols spoke at the annual State of Education breakfast hosted by the League City Regional Chamber of Commerce. Nichols gave an overall view of COM from student enrollment to new buildings. COM, he said, has seen a 19 percent increase in enrollment over the past few years and the college also has seen an improvement in the number of minority students enrolled. When it comes to preparing students to transfer to a four-year university, Nichols said COM continues to participate in regional and statewide guided pathways initiatives that includes program mapping, onboarding, assessment, high school alignment, academic support and advising. Nichols also shared artist renderings for a new STEAM/Allied Health Building and Student Success Center. Also participating in the breakfast were Dr. Brenda Hellyer, Chancellor - San Jacinto College, and Dr. Steven Berberich, Provost - University of Houston/Clear Lake.